DD5LP/P – March 29th. 2017 – DL/AM-177 Kirnberg & DL/AM-178 Ammerleite. With the winter bonus period coming to an end and some easy summits not yet activated this year, along with the weather being dry and sunny, I decided to grab the opportunity and head out and activate two summits I know from previous activations. I posted no alert on SOTAWatch. I decided rather to just self spot (in fact this worked on the first summit but with no cell coverage at Ammerleite I was happy to be spotted by a chaser on the second summit). 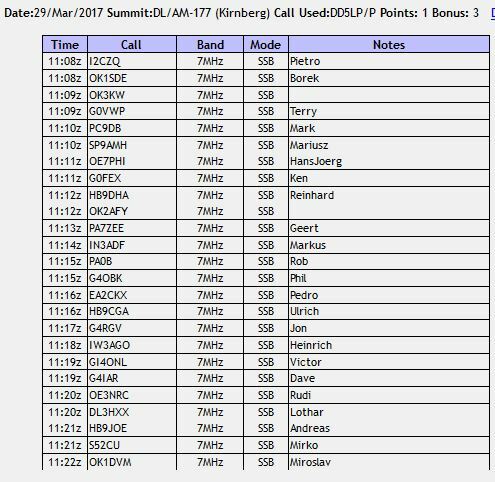 No special equipment on these activations, rather the kit I know works reliably – the 817, Amp and Aerial-51 OCF on the LambdaHalbe 6m pole. All of which was ready to go following the previous activations. I always charge the batteries before putting the bags in the cupboard, so that I can simply “grab and go”. Kirnberg is next to a farm called Gigersau towards the end of a fairly long single track road. Be careful where you park – one time here, I had to go and ask for help from the farmer to tow my car out of some boggy ground! No worries with that on this activation, but I still parked on the side of the road, rather than on the grassy patch in front of the notice board! Ammerleite is above Böbing and on my first two activations, I could drive up to the same level as the summit and then walk about 50 metres across to the cross at the summit itself. That access road is now classified as farm and forestry use only and while in some areas the locals don’t mind, in this case, they can get quite annoyed, so the alternate parking spot (as described in detail in last years blog on the activation of Ammerleite (aka Schmalz)) is located just to the north of Böbing at a small hut. From here it’s about a 3 kilometer walk with a rise of about 1200 metres, so allow 20-25 minutes for this (each way). My plan was to activate both Kirnberg (DL/AM-177) and Ammerleite (DL/AM-178) in one outing. Logically it made sense to do Kirnberg first and then Ammerleite. Arriving at Kirnberg all went to plan – I set everything up, took some photos, spotted myself and then called CQ. The following 25 contacts on Kirnberg took just 13 minutes ! As I was packing up a walker appeared and asked what I was doing. He was from the north of Germany and staying at a “farm-stay” down the hill (I think he had just popped out, to get a break from the family) in any case we had a nice conversation and then as he left I kept packing up. I then realised my “short chat” had been nearly 20 minutes, meaning my hope of getting to the next summit an hour after I had gone QRT on this one was not to be. But the weather was nice and I had time, so I headed back down to the car – only a few minutes walk down the slope from the summit, packed everything in and set-off for Ammerleite. As I was driving along I was thinking about the number and strength of contacts made and would have been happy with that success. Little did I know that this first contacts total would pale into insignificance when I had finished on the next Summit. On both summits I have to say I was bowled over by the number of chasers and their patience and persistence. Upon arriving at the last spot the road at Böbing that is open to the public and parking up. I picked up my gear and set off up the track. This time the track seemed longer and steeper than I remembered and it wasn’t long before I started panting for air, so I slowed down a little. Around the next corner the track was blocked. A farmer had his tractor and trailer across the track, cutting and loading firewood. After a short conversation with him, confirming I was on the “approved” route up to the cross, I set off again. I was probably only about a quarter of the way up at this point. Suffice to say that when I got to the summit, the wooden benches there were put to good use while I took a drink of water and rested a while. While setting up I got another farmer visiting me, he was collecting wood which had already been trimmed from the trees. I explained to him what I was doing and again he expressed interest and warned me that f I needed to use my cell phone, coverage was very patchy in this area. He was 100% correct and despite having two SIMs on the two main networks in Germany in my smartphone, I was unable to spot myself. 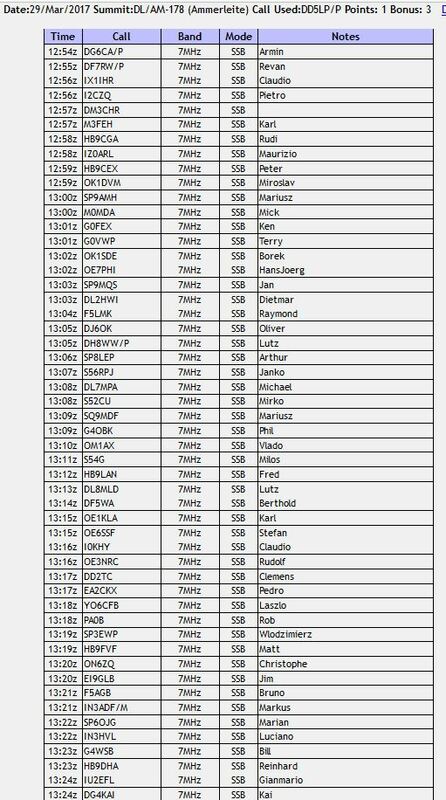 After putting out a CQ however I had a couple of contacts and I asked Pietro I2CZQ if he wouldn’t mind spotting me – this he did and then there was just a wall of stations! The pile-up was very impressive, I managed to work 52 chasers in 30 minutes and I know I missed a few – it really was a wall of noise – as witnessed by a passing local bicyclist who turned out to be a HAM – he had heard of SOTA but was blown away by the pile-up! I noted his call down but I must have got it wrong unfortunately. Perhaps I’ll meet him again on another summit? So much for “bad” conditions HI. While operating a couple of stations said my (compressed) audio didn’t sound right, so I turned the RF-Clipper off and noted that I needed to look into that when I got home. Following the battery problems with the amplifier on the last couple of activations, I had a monitor attached the whole time and at the end of the activation the four cells in the LIPO battery were all showing around 55-60% charge left. Interestingly this translated to 25-30% charge indicated on the battery charger at home. I wonder which indicator is showing the correct value? (The battery was disconnected before I packed the gear up, so it did not discharge the extra amount between the summit and home). All in all, although about an hour behind schedule at the end of the day, it turned out to be two very successful activations for which I got one activator point and three winter bonus points for each summit. Now I wonder if I can fit in another activation before the end of the month …. Don’t trust band condition predictions. Things can turn out a lot better than you expect! Always be prepared to take some time to explain Amateur Radio to strangers who show an interest. This entry was posted in SOTA and tagged Ammerleite, DL/AM-177, DL/AM-178, Kirnberg, SOTA by VK2JI DD5LP G8GLM. Bookmark the permalink.